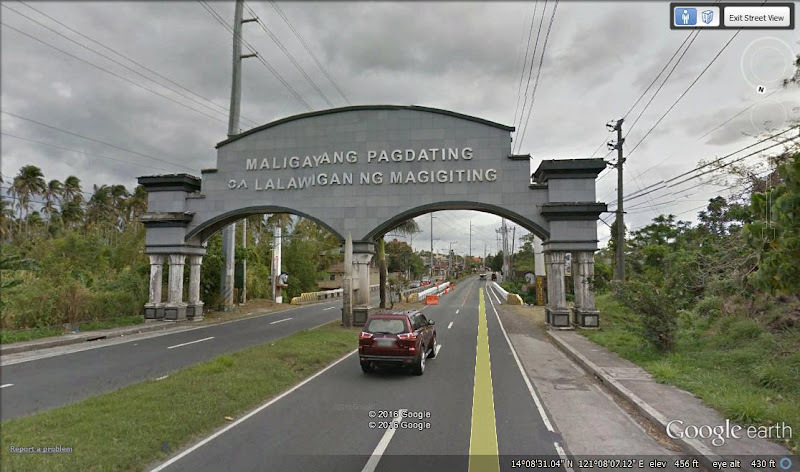 The Batangas Province welcome arch. Image credit: Google Earth. The Philippine Institute of Volcanology and Seismology (Phivolcs) has published a primer on its web site dated 11 April 2017 explaining the swarm of earthquakes that hit Batangas earlier this month. The primer also attempts to diffuse fears people expressed particularly over social media after the series of tremors about possible volcanic activity, tsunamis and even geothermal drilling. The primer is provided in its entirety below as a service to and for the information of the public in Batangas. What is happening at Batangas Province? A phenomenon called earthquake swarm is currently happening at Batangas. An earthquake swarm is a burst of earthquake activity clustered in a specific area in a short period of time due to movement of a fault. The Batangas swarm started on 4 April at 8:58 PM, and is still ongoing to date. Large-magnitude earthquakes have also affected Batangas in the past! At least six large earthquakes had affected Batangas province – the Mindoro earthquakes of November 15, 1994, April 9, 1942, and May 26, 1889, and the earthquakes of April 26, 1972, October 1, 1869, and September 16, 1852 whose epicenters were located in West Philippine Sea. The 1994 Magnitude 7.1 Mindoro Earthquake was felt at intensity VII in the epicentral areas and may have shaken Batangas at intensities of V to VI or even VII while the 1889 Magnitude 6.4 Earthquake was felt at Intensity VI-VII in Mindoro and Batangas. The 1852 Magnitude 7.6 and 1869 Magnitude 6.6 offshore events were reportedly felt at Intensity VII in and around Batangas. Although there were no accounts of direct damage in Batangas due to the 1994, 1972, and 1942 events, the 1852, 1869 and 1889 events damaged several buildings and infrastructures in the area. Why do earthquakes occur at Batangas? Batangas is one of the seismically active areas in the Philippines. Instrumental monitoring of earthquakes for the past century has detected many small to large-magnitude earthquakes near Batangas generated by the Manila Trench and Lubang Fault. The Manila Trench is an earthquake generator located offshore west of Luzon Island, roughly parallel to the Philippine archipelago in the north but veers very close to land at the southern tip of Occidental Mindoro. Another offshore earthquake generator is Lubang Fault, located between Mindoro Island and Batangas, which is also the locus of small to large-magnitude earthquakes. Other active faults on land are present in Southern Luzon, such as the Valley Fault System and the Philippine Fault. The current series of earthquakes in Batangas can be attributed to the movement of an unnamed local fault in the vicinity of the Tingloy-Mabini area. Can these present earthquakes indicate volcanic activity? No. Although Taal Volcano is located approximately 30 kilometers from Mabini, Batangas, the present network of instruments located in and around Taal Volcano shows no indication of any significant change of monitoring parameters suggesting renewed magmatic activity. However, as part of PHIVOLCS’ monitoring procedures for moderately large earthquakes occurring near active volcanoes, the institute will closely monitor this earthquake events in relation to any activity that may be monitored in Taal Volcano. Can these recent earthquake events trigger a destructive tsunami? No. The magnitude is not big enough to generate a destructive tsunami. Can human activity such as geothermal drilling, blasting, etc. trigger large earthquakes along active faults? No. Hypocenters of moderate- to large-magnitude earthquakes along active faults are too deep to be influenced by any human activity. What can we expect from the current earthquake activity? Small to moderate magnitude earthquake events can still occur in the following days to weeks. The best course of action is preparedness – the damaging effects of earthquakes can be minimized if we prepare ourselves for the event. Because a large-magnitude earthquake, either from active faults in Luzon or the Manila Trench may affect Batangas as a whole, it is always prudent to prepare for such an eventuality. What can we expect in the event of a large-magnitude/high-intensity earthquake? Strong ground shaking may cause extensive damage to, or even the collapse of houses, buildings, bridges, and other infrastructures. Collapsed structures usually account for most of the casualties during a strong earthquake. Falling objects may also cause injuries. Aside from strong ground shaking, what other seismic hazards are life threatening? Landslides, rock falls, and other types of mass movements may occur in mountainous or hilly areas. Liquefaction manifested by sandboils or lateral spreading may affect low-lying, waterlogged, sandy areas near the coast or at the banks of rivers. What is the role of PHIVOLCS? PHIVOLCS operates and maintains a network of 93 seismic stations spread across the Philippines. Twelve of these seismic stations are located in or around Batangas. Four of which are staffed-controlled located in Puerto Galera, Tagaytay, and Lucban and Guinayangan in Quezon and seven are remote seismic stations located in Lubang and San Jose in Mindoro, Busuanga and Cuyo in Palawan, Romblon, Marinduque and San Andres in Quezon. Data from the seismic stations are used to determine the locations of earthquakes, as well as the characteristics of the earthquakes generated. We also have a volcano monitoring network in and around Taal that could record seismic activity. Aside from monitoring the occurrences of earthquakes, PHIVOLCS also conducts hazards analyses and assessment, and makes this information available to the public. PHIVOLCS works hand-in-hand with other government agencies in mitigating the damaging effects of earthquakes. Please visit our website at http://www.phivolcs.dost.gov.ph for earthquake bulletins, volcano updates, and other information on earthquakes and volcanoes.